Posted July 31st, 2015 by Kirti & filed under AdWords Tips, Keywords, Negative Keywords. Negative Keywords is an essential component of campaigns. If you are into the business of selling red shoes and don’t want to show for search terms such as red socks, then you add socks as a negative term. Negative keywords control irrelevant traffic from seeing your ad and you have an ace up your sleeve, by saving money on your ad spend. Posted July 27th, 2015 by Kirti & filed under PPC Roundup. Posted July 22nd, 2015 by Kirti & filed under AdWords Tips. BrandVerity’s Q1 report shares analysis of 250 consumer brands across 10 industry categories. The study intends to provide benchmark for brands to apply while advertising via paid search. It briefly pictures when and how brands are losing out on traffic as a result of Trademark usage. Posted July 20th, 2015 by Kirti & filed under AdWords Tips, PPC Roundup. Last week Google announced the long awaited developments in ‘micro-moments’. Some in the market and some yet to be rolled out, read their exciting features and what it holds for you. Bing followed with their announcement of ‘Shopping Campaigns’, set to give competition to Google. 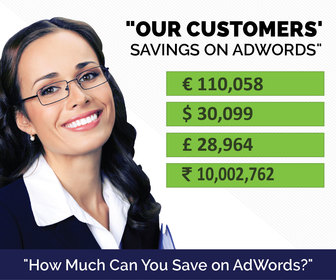 Posted July 17th, 2015 by Kirti & filed under AdWords Tips. Adobe Digital Index gives valuable insights from the digital advertising industry, in their Q2 report. A lot is covered here which can be considered while building up your digital marketing strategy. You can get indepth information on search and display advertising busines, effects of Google’s algorithm changes (Mobilegeddon), ad spend across devices and more.